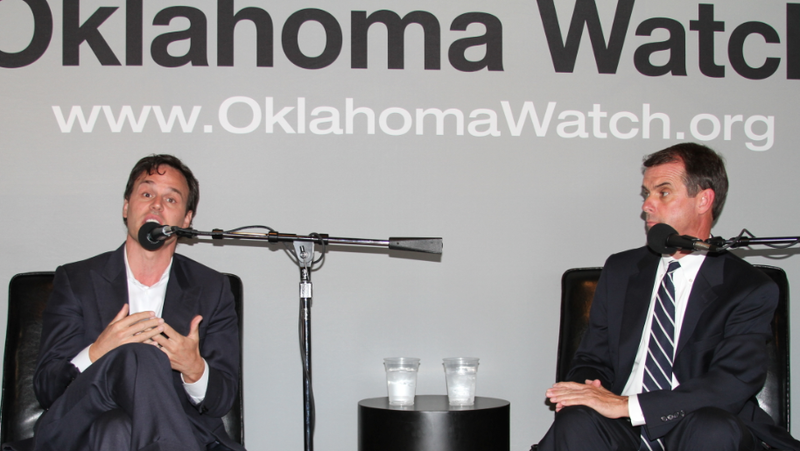 Andrew Rice, executive director of Variety Care Foundation, and Terry Cline, Oklahoma commissioner of health, discuss the Affordable Care Act at Oklahoma Watch-Out. Apprehension and optimism abound in Oklahoma as the Affordable Care Act shifts into higher gear with the opening of the federally-run health-care marketplace on Oct. 1. At the same time, residents and business owners are awaiting the unveiling of an “Oklahoma Plan” to expand health coverage and improve health outcomes that Gov. Mary Fallin promised in her State of the State speech earlier this year. These and other topics were discussed Tuesday evening during the first “Oklahoma Watch-Out” community forum presented by Oklahoma Watch, a nonprofit journalism group. The event was held at Kamps 1910 Café in Oklahoma City. 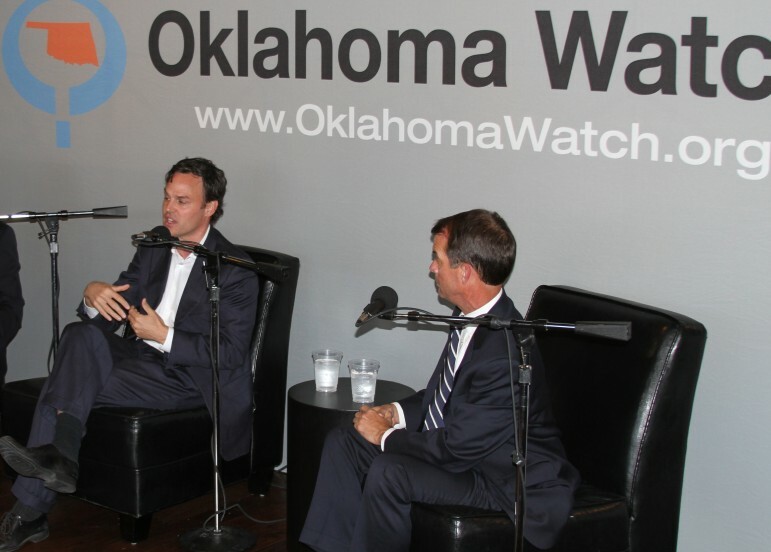 The featured guests were Terry Cline, Oklahoma commissioner of health and Gov. Mary Fallin’s secretary of health and human services, and Andrew Rice, executive director of the Variety Care Foundation and a former state senator. Both Cline and Rice told the crowd of about 65 some of the ways the Affordable Care Act, commonly known as “Obamacare,” would affect Oklahomans and how the state has responded to implementation of the law. They also answered questions from the audience that ranged from how the law would affect rural hospitals to whether young uninsured people will seek coverage. Cline said the health-care law would greatly expand access to health care for many individuals, but that increased access was only part of the solution. Rice, whose foundation supports the Variety Care system of clinics for low-income people, said access is key to better health outcomes and without access, it would cost more to treat the sick people who only get sicker without care. “We in the community heath-center movement do believe wellness is easier with access,” Rice said. Cline was asked why the state is not doing more to inform the public about how to enroll in the health care exchanges, where people can shop online for private insurance. He said the state did not receive federal funds to put the information out there and the state wants to offer accurate information about the complex, often confusing law. “The governor has been very, very clear about this. She wants people to have access to accurate information, for people who are interested in that,” he said. He added that information is being given out across the state through 69 county health departments. The state Department of Health’s website has a page with various links to the federal government’s main site for the Affordable Care Act, www.healthcare.gov. Cline also spoke about the state’s Insure Oklahoma program, which provides assistance with premiums to businesses and individuals using Medicaid, state and tobacco-settlement funds. Insure Oklahoma has enough funding for a maximum of about 35,000 people. The program was due to expire at the end of the year, but the governor’s office worked with the Obama administration to get a one-year extension. Fallin announced this year that the state would develop an Oklahoma Plan to expand access to health care and improve health outcomes. Cline was asked to help develop the plan. The state hired a consultant, Leavitt Partners, to study the issue, and the firm recommended the state use an Insure Oklahoma-type plan to take federal Medicaid money that would have gone toward Medicaid expansion, which the governor rejected, and subsidize the purchase of private insurance by uninsured people who would have qualified for expanded Medicaid. Cline said an Oklahoma Plan hasn’t been completed yet because Fallin has been focused “almost singularly” on negotiating the extension for Insure Oklahoma. Asked whether an Oklahoma Plan would be unveiled within a year, Cline did not offer a time estimate. He said the state and the federal government must figure out a way to improve the system within fiscal constraints and find something acceptable to Oklahomans. “The governor has been very clear that she wants to make sure people do not lose coverage,” Cline said. In addition, Fallin hopes to have an Oklahoma plan that would ensure access to higher-quality, lower-cost care. Rice and Cline said they do not expect large numbers of young people to sign up for coverage under the Affordable Care Act. Instead, those people will pay a penalty for not having coverage. “I imagine there will be quite a bit of young people who won’t (get coverage),” Rice said. Regarding rural hospitals, Rice said such hospitals would probably take a hit because of certain cuts in program reimbursements by the federal government. The cuts resulted from hospital groups agreeing to them in exchange for more people having medical coverage under the health law. However, when the U.S. Supreme Court struck down the provision requiring states to expand Medicaid, it left hospitals not being able to make up those cuts through expanded coverage, Rice said. At the community forum, guests Andrew Rice (left), executive director of the Variety Care Foundation, and Terry Cline, Oklahoma commissioner of health, discuss the Affordable Care Act with Oklahoma Watch Executive Editor David Fritze and visitors.